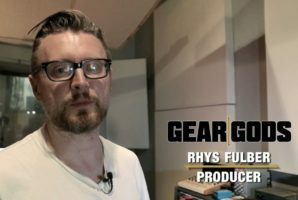 The Manx are probably the most interesting band we’ve had the pleasure of featuring here on Gear Gods. Their brand of cartoony, folk-inspired avant-garde punk will veritably make you uneasy, but simultaneously unable to look away, and right in that little space is where all The Manx’s magic happens. This makes sense, given that most of the members have worked on projects like Rick and Morty, Eric Andre, and Robot Chicken (to name a few), so we are elated to be able to bring you their Rigged, only right here, on Gear Gods! Now, you’ll notice here that there’s not really anything “typical” about these dudes’ rigs. Most of their setups include custom electric instruments, such as a mandolin (4 strings), banjo (with guitar strings), upright bass (murdered out with upside down crosses for F-holes), and a synth accordion (important). They then go above and beyond with their custom arcade game amps (yeah, that’s right), featuring classics like Rabbit Breeder, Hateful Goo, Mind Grinder 2, and Armenian Galaxy (pics below). And to top it all off, they rock a few tons of gnarly effects pedals and a whole bunch of other fucked up accoutrements which manage to tie the whole act together. One of the most impressive things about this group is just how committed they are to the image of what The Manx stands for. Nothing is held back when it comes to repping the slimy, punky mystery that surrounds every fiber of this band’s being. At the core, there’s a folk rock element to The Manx’s sound, but that’s about as close to nailing down their style as you can get before the oozy, Bunglian, black metal, punk, and retro-futuristic tentacles take hold. There’s this playful, go-into-the-woods-barefoot-on-acid-and-sacrifice-a-goat-to-the-ancient-druids vibe going on here, and we can’t get enough of it. You can pre-order the band’s newest album Mystery Skum and The Odyssey of Goo (out July 20th) on Bandcamp, stream their diverse catalogue of gooey hits via Spotify, and follow them on Facebook for all the splattery splendor the band has to offer. If there’s one thing these guys can teach us, it’s that it’s okay to be yourself, no matter how goddamn wacky you think you are.